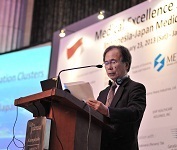 According to Ministry of Economy, Trade, and Industry’s strategy in 2012 to promote the medical equipment and services in overseas, Med in Japan hosted the seminar on “Indonesia-Japan Medical Collaboration” on February 23rd in Jakarta, Indonesia. In the first part, H.E. Katori Ambassador of Japan in Indonesia gave the opening speech and then Indonesian oncologist Professor Muthalib gave a presentation entitled “Cancer Problem in Indonesia”. Afterward, Professors from Japan made presentations on medical services in Japan: Professor Ryosuke Tsuchiya from The Cancer Institute Hospital made a presentation entitled “Advanced Cancer Management in Japan -Screening through Systemic Diseases”, Professor Koichi Tanaka from Foundation for Kobe International Medical Alliance made a presentation entitled “Kobe Biomedical Innovation Clusters and Liver Disease in Japan”. In the second part, Japanese enterprises including Hitachi Group, Sumitomo Heavy Industries, Ltd., Toshiba Medical Systems Corporation, and SHIP HEALTHCARE HOLDINGS gave presentations on Japanese medical equipment. 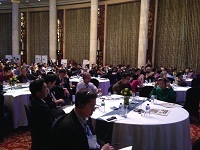 There were over 250 participants in the seminar. This great opportunity is expected to help develop medical collaboration between two countries. On the previous day of the seminar, Med in Japan Team visited the Ministry of Health, Pertamina Hospital and GADING PLUIT Hospital to interact with medical experts in Indonesia. For more details, please contact Med in Japan.